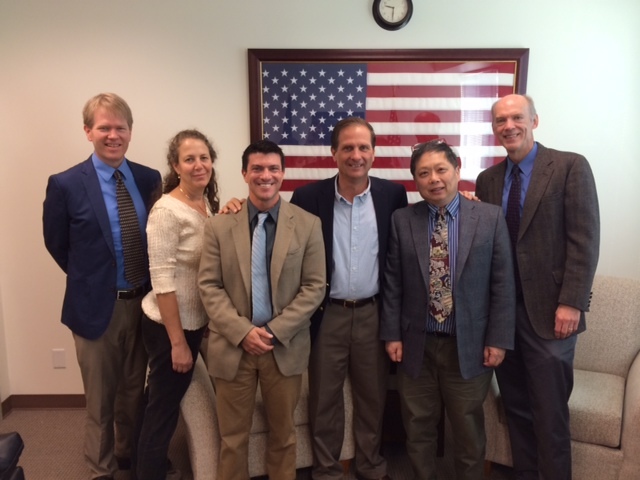 This week, ATS members from the University of Utah's Division of Pulmonary, Critical Care and Sleep met with their House Representative, Chris Stewart (R-UT) in his Salt Lake City office to urge his support for NIH and CDC funding. Rep. Stewart is a member of the House Labor-Health and Human Services (L-HHS) Appropriations subcommittee, which determines annual funding levels for NIH and CDC proposed by the House of Representatives. In this important position, Rep. Stewart is a key congressional target for ATS advocacy. The innovative research at the University of Utah, including areas such as cystic fibrosis, sepsis and acute lung injury, and the need to foster this and our national biomedical research enterprise through NIH, was the focus of the discussion. ATS members also raised the issue of supporting CDC funding through a discussion of tuberculosis (TB) and influenza. Lastly, the group raised concern about the need to improve air quality in Utah, pointing out the costs to both the people and the economy of the state. ATS members Robert Paine, M.D., Samuel Brown, Estelle Harris, M.D., Matthew Rodina, M.D. Ted Liou, M.D. and ATS DC staff participated in the meeting. From left: Samuel Brown, MD, Estelle Harris, MD, Matthew Rondina, MD, Rep. Chris Stewart (R-UT), Theodore Liou, MD, and Robert Paine, MD.